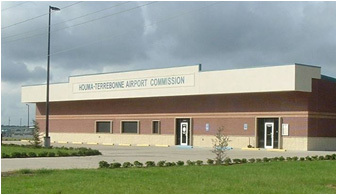 The Terrebonne Parish government is supporting plans for the Houma-Terrebonne Airport Commission to move forward with plans to bring unmanned aircraft to the area. The airport is partnering with the Terrebonne Economic Development Authority, Nicholls State University, Fletcher Technical Community College and private companies to bring in the modern, developing technology. The airport has dedicated $200,000 for the program and set aside land to develop a new ramp, hanger and facility for the program, officials told the Parish Council today. The first phase of the project is estimated to cost about $2.5 million, said Joe Wheeler, airport executive director. Due to the declining oil industry affecting the local economy, the group has been working to diversify local industries. “We all know the shelf is never going to be the same as it was without fracking,” commission member Joshua Alford said. Members of the team traveled to the University of North Dakota in December, one of the nation’s hubs for this kind of technology. The airport hopes to work with the program already in existence there by building upon the resources available in Terrebonne. “Everything they’re doing, we’re doing over water,” Alford said, referring to the area’s pipelines, wetlands and border security efforts. The new industry, banking on the automation trend, is expected to bring 1,600 jobs to the state over 10 years, Wheeler said. Because the airport is uniquely situated with easy access to the Gulf of Mexico, it is more amenable to the unmanned program and Federal Aviation Administration guidelines, he said. Studies have shown that oil and gas companies are looking to have fully autonomous drilling by 2025. To keep up with demand, the group’s five-year-plan seeks to have fully or highly autonomous aviation systems ready locally by 2022, Wheeler said. Existing companies like ERA, Aurora and Bell are involved in the effort. The airport commission is working to establish a nonprofit organization with a public-private board that will oversee the regulation of these aircraft, Alford said. “The airport is a diamond in the rough that hasn’t been polished yet,” Councilman Dirk Guidry said in support of the plan. Parish President Gordy Dove also expressed 100 percent support.